Send Lovely Flower Close To My Heart to Chennai. Gifts to Chennai. Send Flowers to Chennai. 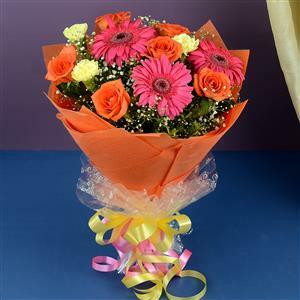 Description : Multiply the happiness of your loved ones as you send them these flowers as gifts to Chennai. The hand tied basket containing 6 Orange Roses, 3 Peach Gerberas and 3 Yellow Carnations will bring bundles of joy for the loved ones. Send Gifts to Chennai and let your gifts add joy to the occasion.